I belong to a couple of weaving groups on Facebook and 'lurk' for the most part. One smart voice there is Margaret Coe who ably stick handles questions from newbie weavers. Some months ago Margaret recommended a neat trick for when you start a new warp off. There it is shown in the picture above and some of my more regular readers will have noticed I have been using it for the past few projects. Its the Two Stick Start. It the best tip I have tried in a long, long time! It just works. When I wound my pirns I ran the weft yarn through a clean damp cloth as I wound them. This tames the wirey linen and you can get a nice tightly wound pirn. The cloth is damp, and not overly wet so the yarn dries quickly. Once you use this on one pirn, all weft for the project must be done the same way or there will be changes in the cloth and the way it weaves up. I wove six inches of plain weave for my hem allowance and then ladder hemstitched every four ends. I used a slippery synthetic cord doubled as my spacer. It slips out quite nicely with a gentle tug. Next was one inch of plain weave to frame the lace, then the lace dance begins! I wove two runners using the same natural grayed / beige linen as weft. The runners were woven to roughly sixty inches from the end of one hemstitching to the next at the other end. There is a small plain weave border down both selvedges and by the time you get to the end of a runner you begin to see the start of some troubled times to come. The plain weave and the lace areas take up differently as the lace centre is more textured and the plain weave is flat. By the end of the runner you can see the plain weave edges pull down more and then curve upwards to the lace. I didn't experience this effect with the red linen runners. I checked a cone of the red today and it has a much softer touch to it. Perhaps as a result of the dyeing process? This natural grayed beige linen has a much firmer feel to it... more wirey. I decided to cut off the runners after each one was woven and retie back on. So the Two Stick Start got a good work out! I decided against using the serger on the raw edges as the serging line can be a tad bit lumpy. I didn't want that ridged line with a flat hem. I used my sewing machine instead and did a stitched zig zag which I think you can faintly make out on the raw edge in the picture above. I steam pressed and measured the hem allowance. I'm going to turn it over by thirds. The beauty of doing this with linen is that it takes a nice fold with just the fingers pressing. You can double check the measurement. I steam pressed it when I'm happy...then fold up to the hemstitching and press and pin. As you can see by the close up above, a raised ridge line from the serger would have shown through and I wanted it flat, flat, flat! The hand sewing was done by a running blind stitch and the three runners were an evenings work by the television. Things started to get interesting the next morning when I filled the laundry tub to handwash the runners. The first to go in was the shorter white beige blend. I lay the runner on top of the suds and let it absorb the water. I came back a few minutes later and started to squeeze it out. I thought I could see a distinct line warp wise in the wet cloth! Oh crap.... I had used a full cone and part of another to wind the warp, but I had checked the batch numbers and they were both the same! Had someone somewhere made a mistake? I laid it to one side and then 'floated' the next runner on the surface of the water. Look what happened below.... the side of the runner absorbed water at a much faster rate! Even when wet there is still a colour difference between the two areas. I gently squeezed water through the cloth but did not wring it out. That would set creases into the cloth, especially the thicker hem allowance. After rinsing, I let it drain well and rolled into a large towel to absorb the excess water. Once they were all into large towels and resting I sat and did some thinking on the situation. Two cones and two different reactions. I had a theory worked out. Well, there was only one thing left to do and that was to see what happened when they were damp / dry and firmly pressed. I could see no sign of any colour change! It looked completely even across the runner. This is a blend of beige and white so perhaps it obscures the issue? This one measures 12.5 inches by 55 inches finished. So here are the all beige runners and both measure 12.5 inches by 61 inches finished. Again, no sign of any variation in colour! Great! So what was it? I think the two cones, while the same batch number, there was a difference in the linen used. It would seem there was almost like a coating on the surface of two thirds of the yarn used.... and not so much on the new cone. It came down to the way the linen was processed. I hope the washing process took care of this detail for the future. If not, there's no sign of it when dry thankfully. All the reed marks disappeared with wet finishing and I would have to say the change in sett also worked very well. I would use this sett of 24 epi with this yarn again next time. So now my Louet Spring is empty and I'm trying to work out what goes on next. Do you ever run out of inspiration from time to time? I know that there is a ton of different weaves out there to try and so I just need to find one that appeals to me. 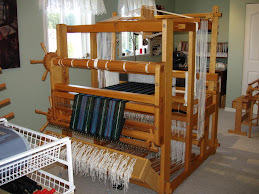 I have to clear off the Woolhouse loom and get a shorter towel sampling warp on there so there's lots of housekeeping details in the studio to take care of. My left knee has been troubling me and so weaving has been considerably slowed.... hence the long time periods between posts. Sorry about that but it can't be helped. I'm just happy to be able to be able to still weave! Hubby Bruce hasn't received a surgery date as yet and as of our last check, they are now booking well into March (which is definitely not the promised January). This may end up placing his surgery and mine on a collision course later this late spring or early summer. Apparently there is a shortage of anesthesiologists. Meanwhile my Dad is still in hospital and the news is he could be there for another week or two before being released. I'm hoping this will all come out in the wash as well! Its time to choose which colour you'd like: periwinkle blue, cream and white, teal green or bronze/ gold. Now, I'd like to share something else with you. Some time ago, I wrote a Remembrance Day post about my various family members who have served in the military in some capacity. It seems that an internet search brought author Tina Bilbe to my blog and we exchanged emails about my maternal grandmother and her service in World War 1 at the Kingsnorth Airfield. 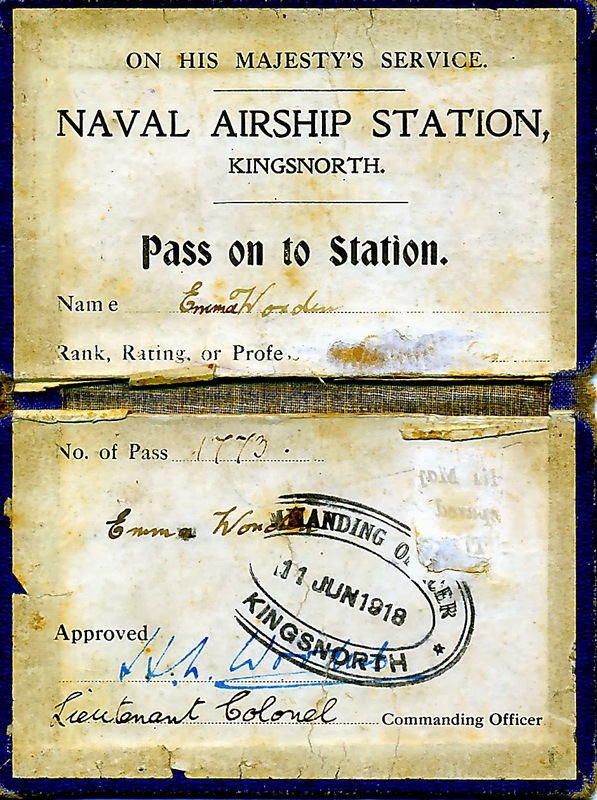 It seemed the history of Kingsnorth Airship Station was apparently becoming a book. This is a picture of the old airfield as it was in 1917 about the time my grandmother served there. It was later cleared away and rebuilt as the more well known airfield that was used during World War 2. This is the sort of airship that used Kingsnorth Airfield at that time period. 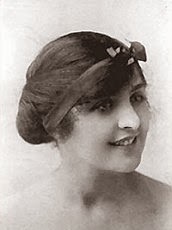 Here is Emma Worden as a young lady before World War 1. 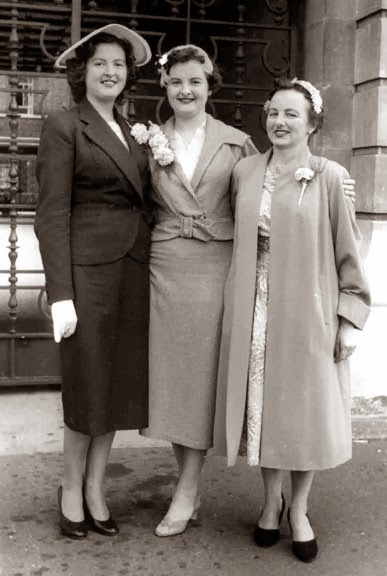 These ladies are her three daughters and my mother is on the far left wearing the dark suit. I think both my mother and hers would be thrilled with the mention in the book. Back to weaving with the next post.... thanks for being there and lets get another year underway! I noticed that Martha at Thistle Rose Weaving has done a review of what she accomplished for the year and thought this was a fantastic idea! All those projects really add up and if they have been gifted or sold, a photographic line up is a nice reminder of what you made. So here's a review of what came off my looms in 2013. Three scarves featuring a silk alpaca warp. First was snapped up by Bruce, the second was gifted to my brother Kent. The third was woven with a fine black tencel weft and sold to a bride groom for a mid December wedding! There was much cleaning and preening of the big loom which took considerable time! Two scarves woven in 100% tencel and featuring colour shifts from eggplant to olive. More exploration of colour with two more scarves... again in tencel and this time featuring eggplant to teal. It was fun to have bright colours on the loom. One of these went to Switzerland! Then a dabble into huck lace and softer colours, this time orchid tencel. Then a dozen guest towels featuring mercerized cotton warp and bamboo weft, all with hemstitching. Then in May we had a week to ten days away on vacation! More towels but this time kitchen sized in a neat, almost 3D- like 12 shaft pattern. Cottolin warp and regular cotton weft. This was a painted skein of silk merino blend and woven with nutmeg brown dyed pure silk.... all from Germany, and sold back to Germany! Then, I had a custom order for two silver and gray runners for a client in San Francisco. (Could be another request coming from them again this year too). With Christmas starting to loom on the horizon, I wove two table runners in a deep bright red huck lace using a delightful French linen. Both sold and no doubt were featured this past holiday. Two shawls in the successful colour combo that came back from the gallery sale. The navy / magenta one is now MINE... and the teal / magenta one went to Switzerland. Using a repurposed warp from another project, I teamed the black tencel with a fine Persian red tencel. This one stayed in Canada and was a Christmas gift in Ottawa, Ontario. Its more sedate twin, featuring a silver tencel also put on some miles and went to Switzerland for Christmas. Can you imagine how fun it would be to travel to hand deliver some of these to the customers? These were the destinations of sales from the items woven this year. (I had other sales but handwovens from the previous year). I also have 3* additional scarves, woven in late 2013 and finished in very early 2014. Two more magenta and navy twill scarves (with one presold ) and one teal and magenta. Both are the same as those shown above. Labels: a look back, annual review, blogiversary, fresh starts, give-away, productivity, what sold this year?